Do you find it difficult to dress with gothic style when winter comes? 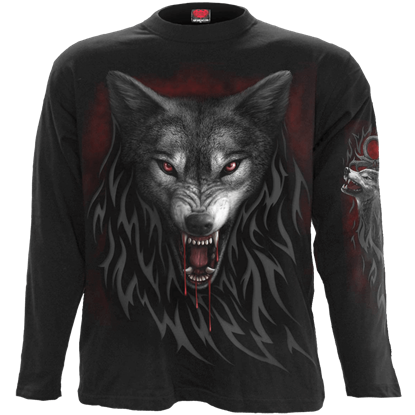 If so, be sure to check out the large assortment of mens long-sleeved gothic shirts offered here in this category. 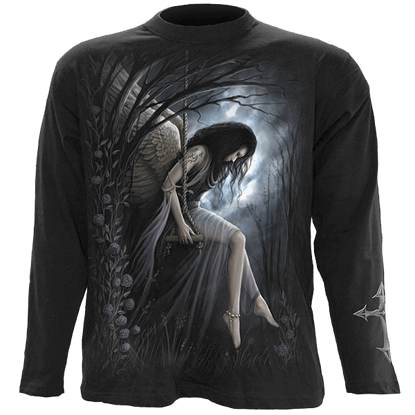 We have a large selection of mens long sleeve shirts, many of which display bold gothic graphics, including lovely angels, gothic fairies, dark dragons, and other creatures of gothic fantasy. Some iconic gothic graphics depict killer clowns, screaming skulls, and sinister grim reapers that remain classics of gothic style. Aside from our printed modern gothic shirts, we provide a great selection of gothic formalwear with our long sleeve gothic officer shirts, gothic button downs, and long sleeve gothic cravat shirts. Whatever your fancy, though, you can bet that there is a gothic shirt here to suit your tastes. When cold weather hits, come to here for long-sleeved gothic attire to keep you looking your gothic best, all season long. Usually when you air guitar, you strum the air with your fingers. With this Air Guitar Mens Long Sleeve T-Shirt, it takes on a different meaning. 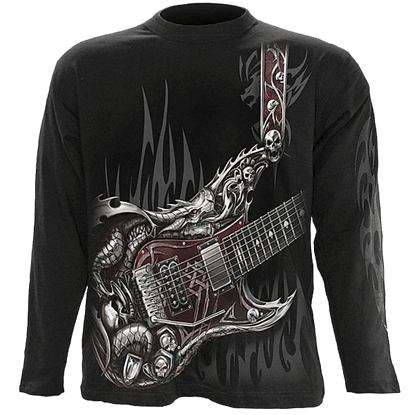 This shirt features an epic elemental guitar that even a reaper can jam on. Sorrow and lament are feelings that this angel appears to be very familiar with. 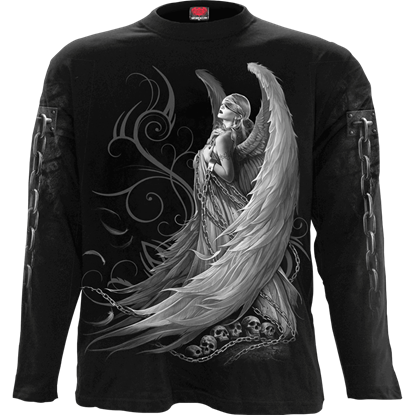 Stunning in its color and design, this Angel Lament Mens Long Sleeve T-Shirt is a gothic garment that features a level of style that is sure to catch the eye. A new age calls for a new reaper. No longer does the reaper of souls carry a scythe. 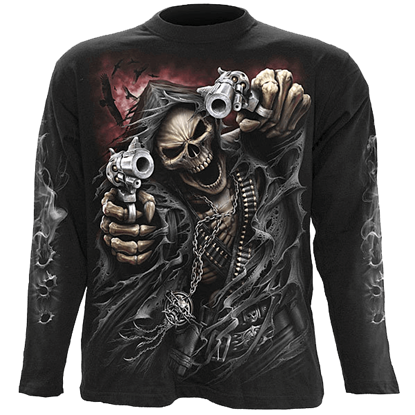 Instead, this assassin of souls favors modern implements, and as this Assassin Long Sleeve T-Shirt shows, the new reaper is just as deadly as the old. Look sharp when you attend your next social gathering wearing this excellent piece of gothic attire. 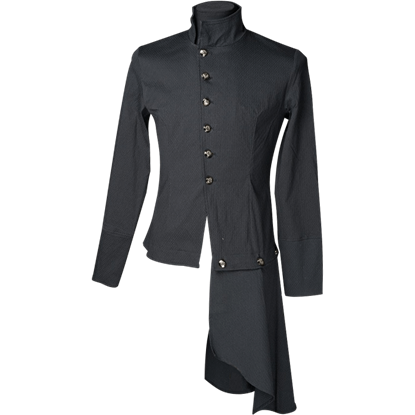 The Black Gothic Officer Shirt includes a buttoned side extension as a dramatic flourish to this long-sleeved item. Legend speaks of the monstrous dire wolf, the alpha of the pack, with red eyes and a craving for mortal flesh. The back of the Black Legend of the Wolf Long Sleeve T-Shirt displays a pair of snarling wolves on the sides of an ankh. It has been said that justice is blind. She is also beautiful and terrifying, thanks to her ways. 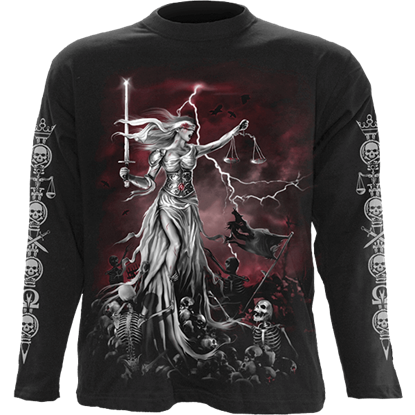 This Blind Justice Long Sleeve T-Shirtgives mortals a chance to glimpse the beauty of Justice, even as she slays the guilty before her. 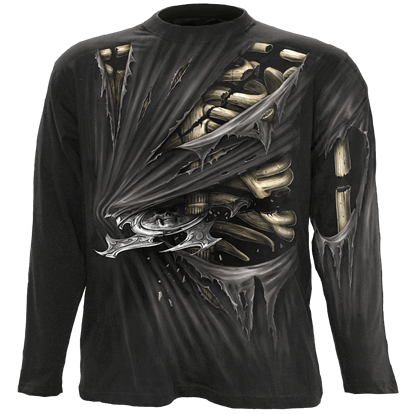 With a name like the Bone Slasher Mens Long Sleeve Shirt, you expect certain things about of the design of this garment. It does not fail to deliver, showing off a design that has shredded fabric, razor sharp blades, and slashed bones. A tome bound in human flesh holds the darkest secrets of magic and the unknown. 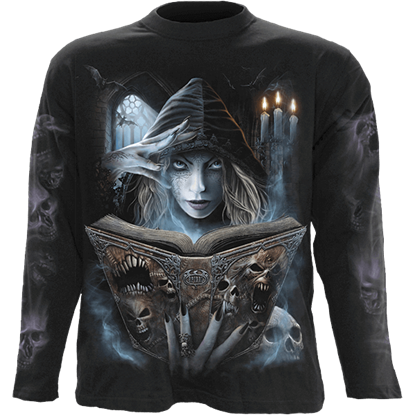 Take home a great piece of artwork that features classic dark fantasy images with the Book of Flesh Long Sleeve T-Shirt, which looks great from all angles. Fallen from heaven, the forlorn angel laments her fate on the Captive Spirit Long Sleeve Shirt. Printed on black, 100 percent cotton jersey fabric, this gothic long sleeve shirt blends beauty and sorrow in a captivating design. Be gone, evil spirit! 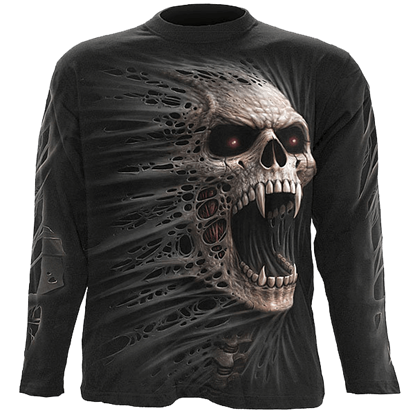 You will look like the recipient of a recent exorcism when you wear this Cast Out Long Sleeve T-Shirt, especially when people look at you from behind and see the vampiric skull as it emerges from the tatters. Beware the Celt, for his warrior spirit is nigh indomitable! 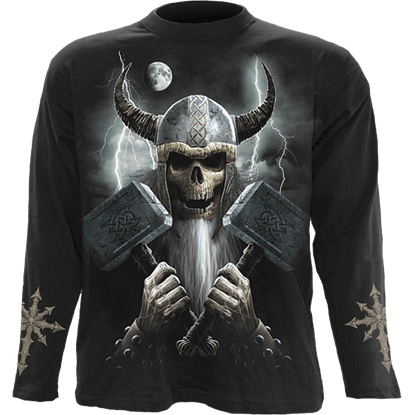 Look to this Celtic Warrior Long Sleeve T-Shirt, which shows off the raw power of the warrior, even as he rises from the grave to bring battle back to his enemies.